Initial rumors have suggested a possible Apple iPhone event being held on September 9. Although Apple hasn't yet confirmed the exact date of their most anticipated event of the year, the rumors have hit the next level. We now have a possible sale date for the upcoming iPhone 6S. This rumor comes from three separate leaks out of Europe and Asia. A leaked memo from Vodafone in the United Kingdom (reported by Mobile News UK) has been followed by Japanese site ITHome and German tech experts Macerkopf, all of which have pointed to September 18 as the launch day for Apple's iPhone 6S and iPhone 6S Plus. All three countries are on the list of Apple's initial launch nations along with the United States and a few others. Another rumor closer to home comes from 9to5Mac who has learned that Best Buy will begin offering AppleCare starting September 14. That is just enough time ahead of a possible September 18 launch. Although some might argue the S line of iPhones are less popular than the non-S line, Apple is not taking any chances. According to the Wall Street Journal, the Cupertino outfit has stocked a record 85-90 million iPhone 6S and 6S Plus devices ahead of next month's launch. The S line of iPhones (iPhone 3GS, 4S, and 5S) have historically included very little hardware changes compared to their predecessors (iPhone 3G, 4, and 5). And this year is expected to be no different. Remember when all those iPhone 6 Plus users reported their devices getting bent without much effort? 'Bendgate', as it was called at the time, created a lot of unwanted buzz for Apple. Although they vehemently denied the issue being widespread enough to issue a recall, the tech giant isn't prepared to take any chances with their upcoming devices. According to Unbox Therapy, who managed to score an iPhone 6S chassis from renown Apple leaker Sonny Dickson, the upcoming iPhones will be a lot stronger. That could also mean they may cost a little higher than the usual price points Apple sticks to. In a bend test performed by the founder of Unbox Therapy, Lewis Hilsenteger, and Elemental Controls, the new chassis is capable of withstanding up to 80lbs of pressure. 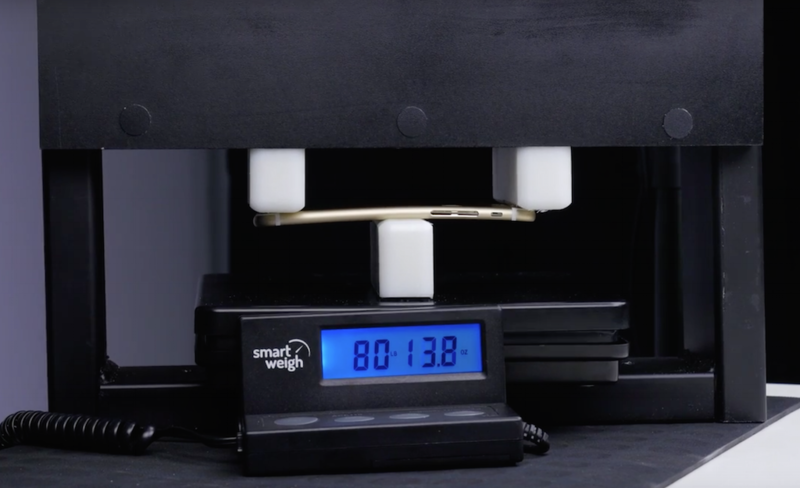 Compare that to a mere 30lbs needed to bend an iPhone 6 Plus. Apple first revealed its upcoming iOS 9 at WWDC in June and showed off some new features. But iOS users have been up in arms about current issues in iOS 8. Apple released an update (iOS 8.4.1) last week but existing issues have not been fixed. For example, the Wi-Fi issue where the iOS device continually drops connection, has still not been fixed for many users. Apple acknowledged the issue in iOS 8.3 but a fix won't be released until iOS 9. - Battery draining quicker than usual. Will iOS 9 also include improvements for Apple CarPlay? Everyone wants more Apps to join the CarPlay family. Maybe Apple will announce that at next month's event. Talking about the event though, the rumored September 9 date has still not been confirmed by Apple. Hopefully we'll get word on that sometime in the next few days. Stay tuned.